A great artist never fears; he doesn’t mind the mistakes—of sketching ugly lines, of splattering unpleasant colors, or trying new ideas. He sharpens his craft over and over again, until he achieves perfection. 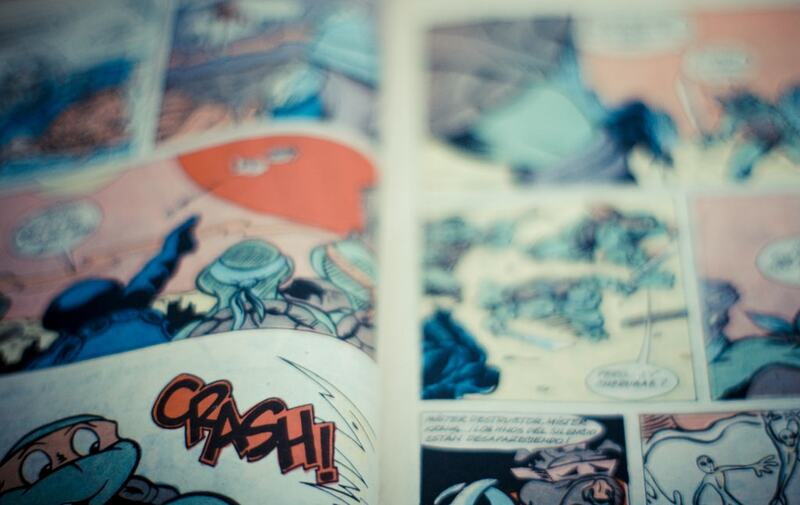 Jack Kirby, Vincent Deighan, and George Perez are the legendary names which inspired many comic book artists. What do they have in common? They all started from scratch. Drawing comics can be a very frustrating task especially if you’re just a beginner. But it can be enjoyable too once you have mastered the basic drawing techniques. The most successful artists use a variety of strokes to create an arresting masterpiece. Remember, the more pressure you apply on the pencil, the thicker your line will be. Freehand drawing is recommended especially when aiming to make your lines natural. 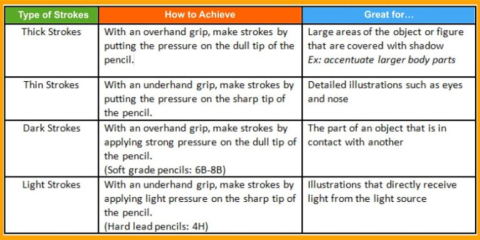 To achieve this, you just have to regularly draw lines without using a ruler. Curves are the foundation of drawing. It is mainly manifested in the skeletal framework of the characters. Let’s assume that you already made an illustration for your comic book, but pencil drawing is flat and boring. To make it come to life, you have to develop shading and inking styles to add effects and expressions to the illustrations. Shading gives the 3D illusion. Undervaluing this method means rejecting the potential of turning your artwork into a beautiful masterpiece. To prevent that from happening, train yourself with the various shading techniques. Before directly going to the techniques, study lights and shadows first, that significantly affect the outcome of your work. Lights and shadows are vital in creating mood, tone, and expression on your artwork. 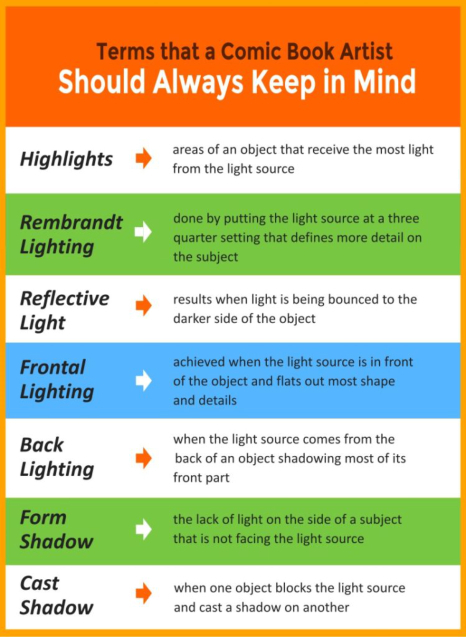 When shading your work, remember the light source. The light can be anything from the outdoor like sun and moon, or from indoor like table lamps. 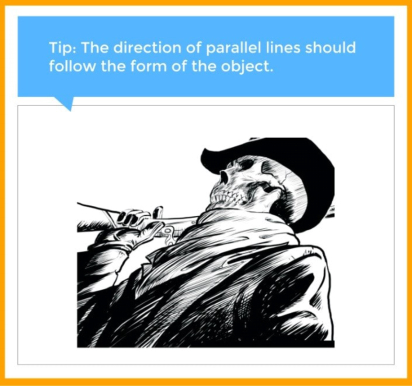 Hatching is a set of parallel (straight or curved) lines that add value to shading. 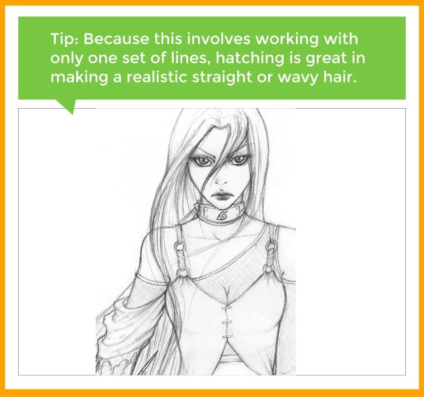 Hatching lines can be drawn closely together or far apart depending on the solidity of the tone you want to achieve. With respect to the light source, hatching can be light (to illustrate that a part facing the light source) or dark (to illustrate that a part receives little to no light). Crosshatching is when one set of lines overlaps another set.It is suitable for cast and form shadows or for Rembrandt lighting when aiming for a smooth gradation from light to dark. Just like in hatching, the solidity of the tone you want to achieve depends on the proximity of the lines you draw. Squiggles is a versatile technique produced by drawing irregular curves or twists. Exerting a consistent relaxed pressure while making squiggles will give your drawing a solid or smooth look. 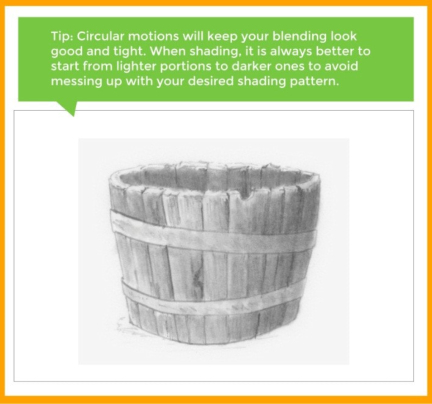 Blending is a shading technique that requires the use of blending tools, such as your fingers, a soft cloth/ tissue, or a colorless waxed-based blending pencil. 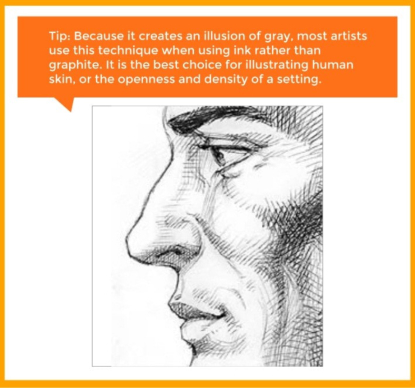 Though simple and easy, this technique requires regular practice just like the others to achieve the desired result in your drawing. 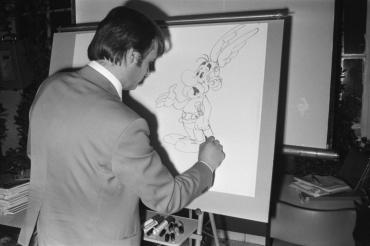 Comic book artists do not just settle in shading their works using pencil. They use ink to incorporate dynamic lighting, and add shading and textures which may be lacking in the penciled work. Generally, a brush or pen is used to ink comic book pages, but some inkers use both. 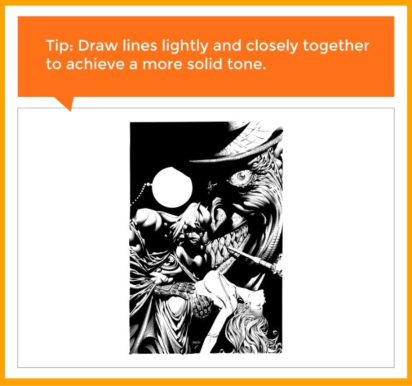 Brushes are favorable when laying line weights or heavy and thick lines producing realistic-looking images. Pens, on the other hand, are best when adding crispness to small details of objects or figures. 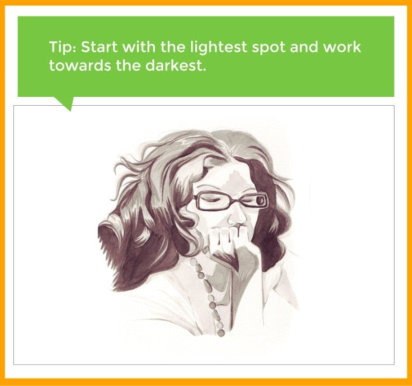 Inking uses the same principles as shading—the first thing to do is to determine where the light is coming from. By doing so, we now know which side of an object receives a heavier and thinner line weights. This graphically bold technique is known for the use of heavy black ink to provide a contrast to the object’s form and volume, often used in newspaper comic strips. It uses three layer values (black, gray, and white) to give depth to panels. For instance, the foreground can be colored black, the middle ground is colored gray, and the background is colored white. Using this technique will help you create a mid-tone shading effect. It is formed with a series of parallel lines that are thin at one end and thick at the other. Feathering is used in softening a hard-black edge, giving form and volume to objects and figures, gradating values from light to dark. This is done by diluting ink in water to produce different shades. It is great to use even without defined black lines to give depth to the image. Before using an ink in cross-hatching, it is best to practice first using a pencil. In that way, you will develop rhythm to your technique and will eventually be more comfortable in applying layers. 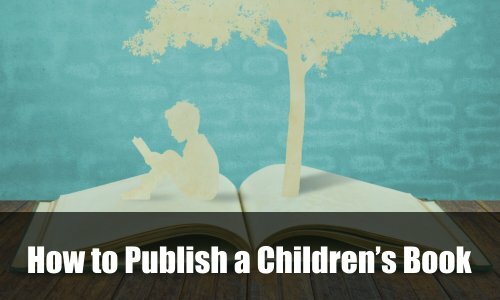 Though these techniques take a while to master, persistent practice is the key to achieve the desired skill in making and designing comic books. P.S. 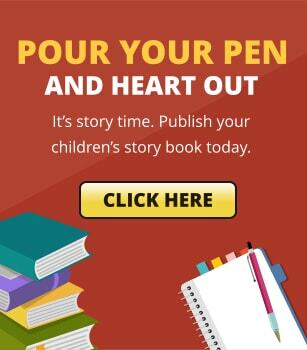 Illustrations come hand in hand with the story’s character development. 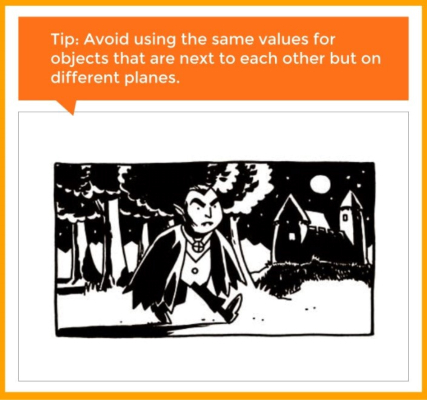 Here’s how you can create your illustrations more interesting.